Back To The Future Finally Coming To Blu-ray! It’s hard to believe it’s taken them this long to get it done, but at long last the entire Back to the Future trilogy is coming to Blu-ray, where it belongs. It arrives just in time to celebrate the 25th Anniversary of the greatest time travel movie of all time. 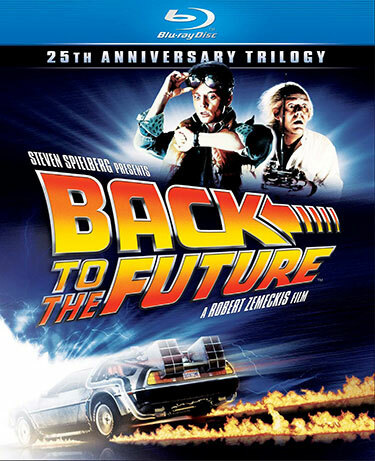 Expect Back to the Future: 25th Anniversary Edition on shelves in both Blu-ray and DVD on October 26, 2010. We have all the details for you after the jump. All three movies come loaded with bonus features and most of all, since it’s Blu-ray, they’ll look brilliant whether you’re watching them on your high-def television or in a DeLorean flying through a parking lot at 88 mph. BONUS FEATURES EXCLUSIVE TO Blu-rayTM: Unleash the power of your HDTV with perfect picture and the purest digital sound available. U-CONTROL: Universal’s exclusive signature feature allows viewers to learn more about their favorite film without ever leaving the movie. Setups & Payoffs: As you watch each of the three films, each “set up” showcases items in the scene that prepare you for a future plot point. When you get to that moment in the film, the “payoff” is shown to complete the correlation. BD-LIVETM: Access the BD-LiveTM Center through your Internet-connected player to get even more content, watch the latest trailers and more! My Scenes: Bookmark your favorite scenes from the movies. Archival Featurette Back to the Future Night: Hosted by Leslie Nielson, this original 30-minute special aired on NBC prior to the first television screening of the Back to the Future.